The music of Disney movies, musicals and theme park attractions has long been a part of the Mormon Tabernacle Choir’s repertoire. In the above photo, Donald Duck was the guest con-duck-tor of the Choir back in 1988, where he led them in singing “Zip-a-Dee-Doo-Dah” during a rehearsal. Even before that, the Choir released an album titled, When You Wish Upon A Star, which was a tribute to Walt Disney. Below are four videos of the Choir performing Disney songs—some of which are included on the tribute album. Wait until you hear the world-class whistling from the Choir. The Choir's recording of "It's a Small World" was released by Disney Parks as part of the 50th anniversary of "It's a Small World." Guest artist Santino Fontana (A.K.A. 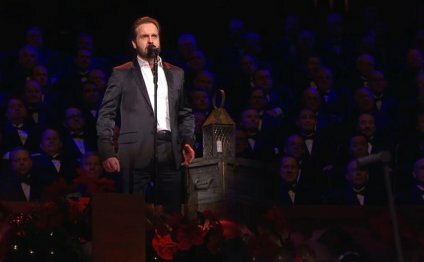 Prince Hans from Disney's Frozen) performs Mack Wilberg's arrangement of "Never Never Land."